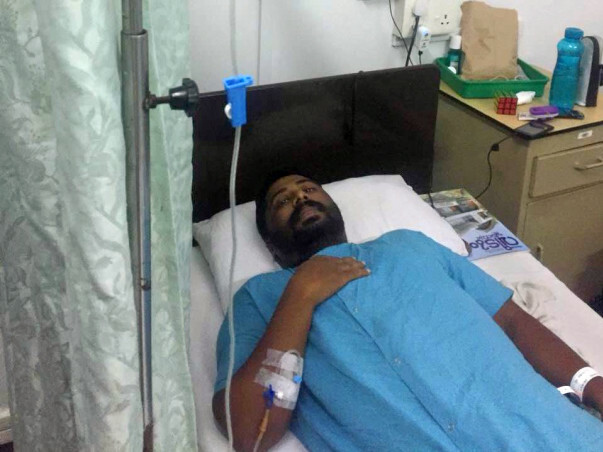 Help Renjith Fight Cancer For The Third Time. We are from the batch of 2006 from MET`s school of Engineering,Thrissur,Kerala, India. Renjith was belongs to Biotechnology Dept. Days were gone smoothly since after graduation. Then everybody have got busy with their own profession and life. In 2012 we were shocked to hear that Renjith has diagnosed with multiple myloma. Since he had chronic back pain, the physician whom he consulted suggested him to take complete analysis and thus it has been diagnosed. 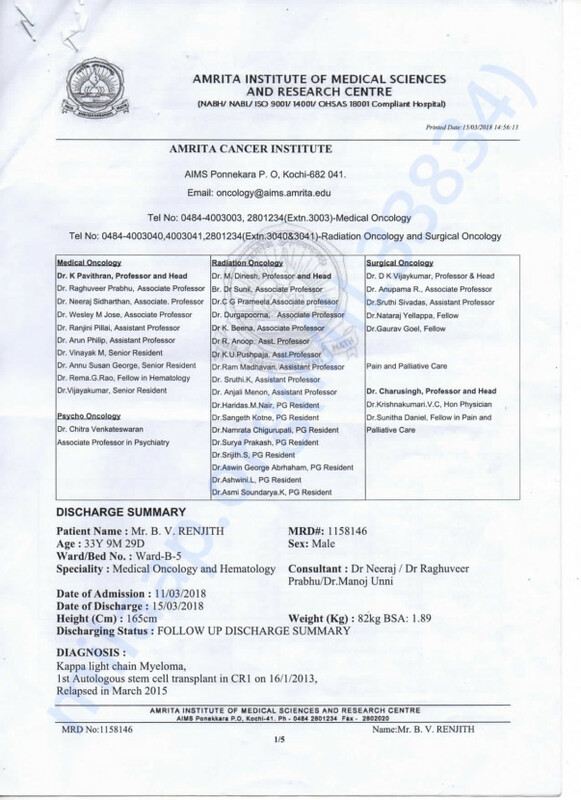 We have taken a multiple opinion from best oncologist including P V Gangadaran at Cochin, and finally decided to start the treatment at Amrita Hospital , Cochin. As a part of his treatment he has under gone chemotherapy and stem cells transplantation. Gods grace, he was recovering slowly and got back into normal life. But in 2015 it has got relapsed and treatment has done in the same hospital under the same doctor, Dr. Neeraj Sidharthan. Renjith has undergone Chemo + bone marrow transplantation. As like previous time he was back to his normal life and things are going pretty well. But impressions of myloma has decided not to leave him, put him in to another tragic situation, on Feb 2018 he has again diagnosed with myloma and which has been confirmed after biopsy. 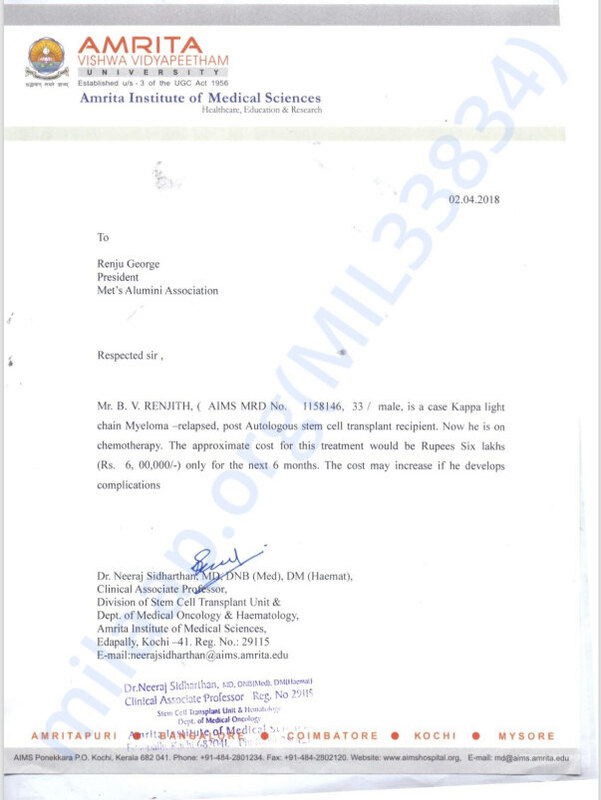 Apart from the support he has received, his earnings and properties were used to meet his previous treatment expenses. At present, since we need smile on his face and to bring him back to normal life treatment fund of INR 10,00,000 is needed. Renjith is a brave guy who owns strong mental power which helped him to come back to his normal life in all previous treatments and we sure he will be back to his life after this treatment. At present his financial positions are too bad to take up this treatment cost. we need all possible support from each of you to bring him back to his life. He owns a family of 5 including his parents. I am at home and doing fine. I am on medication. Few days ago I had developed a fever and the doctor had prescribed some antibiotics. I will be going for another consultation by next week. Otherwise, I am doing quite well. Thank you for giving me your support. I am very grateful to you all. Here is a quick update on Renjit's health. Currently, he is at home and doing better. Once he finishes his all of his 6 cycles of chemotherapy, doctors will conduct some tests to check on the progress on his health. He is on regular medication as prescribed by the doctors and has to visit the hospital twice a week for routine check ups. 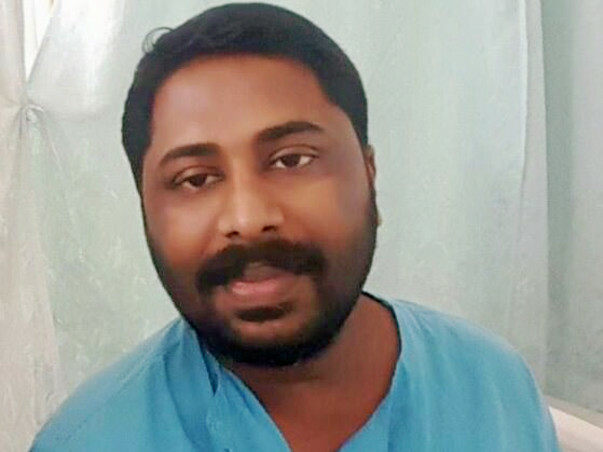 Renjith underwent three cycles of chemotherapy and he has been responding well to the treatment. There has been no side-effects of the chemotherapy so far. Doctors have suggested that the treatment will continue for a while and after that they will decide a future course of action depending on his condition. Thank you all for your love and support, we shall keep you all posted on Renjith's health.